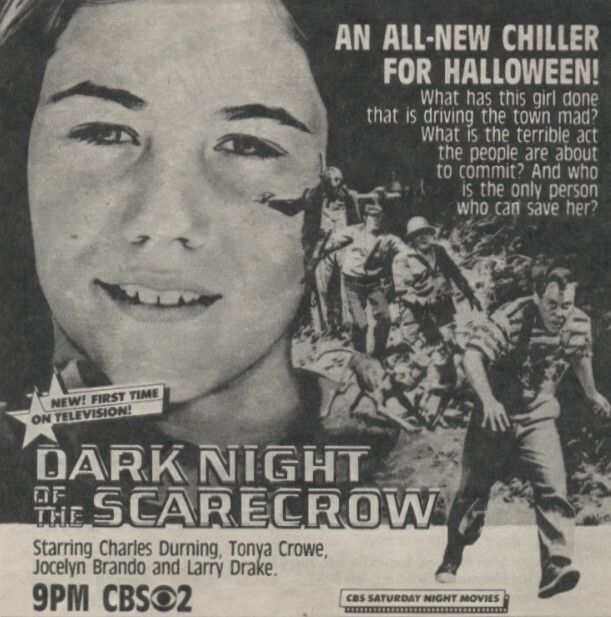 DARK NIGHT OF THE SCARECROW: The Real Monsters Live In Our Minds – Schlockmania! In the 1970’s and early 1980’s, some of the best cinematic frights could be found on the small screen. The networks were doing their best to keep viewers at home during this era by creating their own films to compete with theatrical releases. As it happened, they were pretty good at horror: despite having serious limits on how graphic or adult the stories could be, the best efforts rose to the occasion with strong storytelling that tricked the audience into thinking they saw more than they actually did. Some of them even worked in a message amongst the scares. One of the best examples of t.v. horror is The Dark Night Of The Scarecrow. Originally telecast in 1981, it has remained a favorite with enthusiasts of small-screen scares because it offers the complete package: it is scary, it has a strong storyline, the performances are excellent and, best of all, there’s more going on here thematically than a few frights in the night. Set in an anonymous small town, Dark Night Of The Scarecrow begins with a murder of an innocent. Mentally handicapped Bubba (Larry Drake) is scorned by the rest of the town and takes solace in the care of his kind-hearted mother (Jocelyn Brando) and the friendship of a little girl named Maryann (Tonya Crowe). When a dog attacks Maryann, rumors that Bubba killed her spread like wildfire. Local busybody Otis Hazelrigg (Charles Durning) rounds up a posse to kill Bubba and when they find the poor gentle giant hiding in a scarecrow’s clothes, they shoot him dead. It all ad ds up to a taut little creepfest that is as smart as it is scary. J.D. Feigelson’s script is carefully constructed and never overplays its hand in terms of shocks. He uses the power of suggestion to great effect, never showing the phantom killer and keeping the ultimate revelation carefully concealed until the last few moments. Better yet, he uses his tale as a vehicle to comment on how so-called defenders of morality often barely have a rein on their own personal demons. The film also directed in a precise and skillful manner by Frank DeFelitta. He’s often thought of as an author thanks to hit horror novels like Audrey Rose and The Entity but he also had a parallel career as a screenwriter and filmmaker. Some consider this film his finest work as a director and it’s easy to see why. He makes effective use of an eerie score from Glenn Paxton and imaginative photography from Vincent Martinelli to create an atmosphere that gets under the viewer’s skin within the first few moments. Better yet, he crafts all the key setpieces with nerve-wracking skill and often adds a macabre flourish to cap each one off (the best: a cut-on-action from a man falling into a piece of farm machinery to red preserves splattering onto a dinner plate). DeFelitta also gets strong performances from a cast packed with familiar faces. 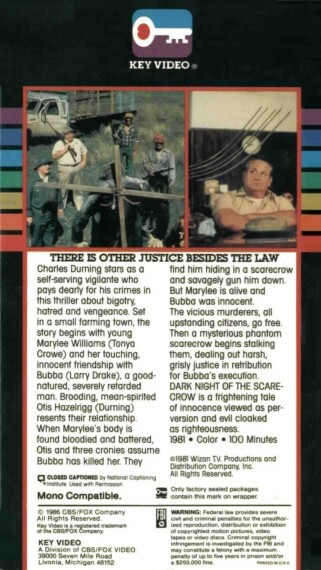 Drake wins the audience’s sympathy instantly with his convincing turn as Bubba (it’s interesting to note he would later play a similarly handicapped character to great acclaim on the show L.A. Law). Brando adds the right note of maternal warmth as his mother and Crowe displays a nice amount of poise as the little girl. The posse is a veritable who’s who of character actors: Lane Smith from Red Dawn, Claude Earl Jones from Evilspeak and Robert Lyons from The Todd Killings. Each turns in a nice performance but Lyons delivers beyond the call of duty: he has a couple of memorably intense scenes with Durning in the latter half of the film and he really displays his skills in those moments. However, the film belongs to Durning, for he is ultimately revealed to be the film’s thematic focal point. The character of Otis begins the story as a manipulator and a hypocrite but is gradually revealed to be capable of much worse. The viewer gets a front-row seat as his veneer of respectability is slowly worn down to reveal the rage and psychopathic tendencies underneath. This requires the naturally likeable Durning to play against type but he rises to the challenge, presenting Otis as a time-bomb of repressed desires who becomes truly terrifying when he is cornered. The end result is scarier than any movie monster you can think of and one of Durning’s finest performances. 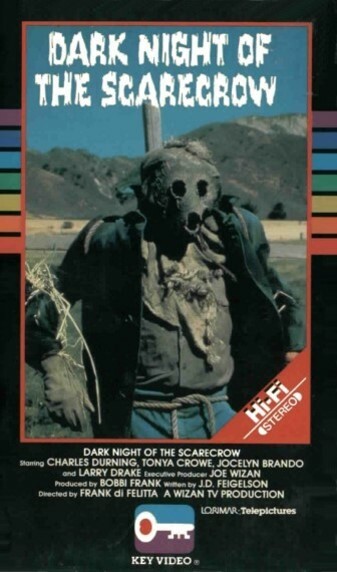 In short, Dark Night Of The Scarecrow delivers all the chills you could hope for as well as an object lesson in the dark side of humanity. As such, it is one of the all-time classics in the world of made-for-television horror. Watched this for the first time last night. AWESOME MOVIE! I really wish they still made stuff this good!